How are libraries celebrating Día? 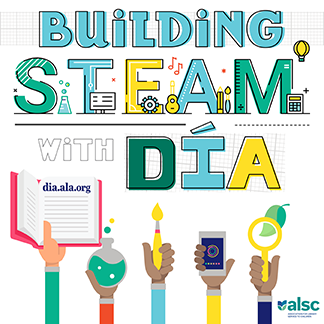 What are libraries planning for Diversity in Action (Día) around the United States this year? ALSC’s Public Awareness Committee decided to find out. Día Musical Bilingual Storytime (photo courtesy of Sujei Lugo). 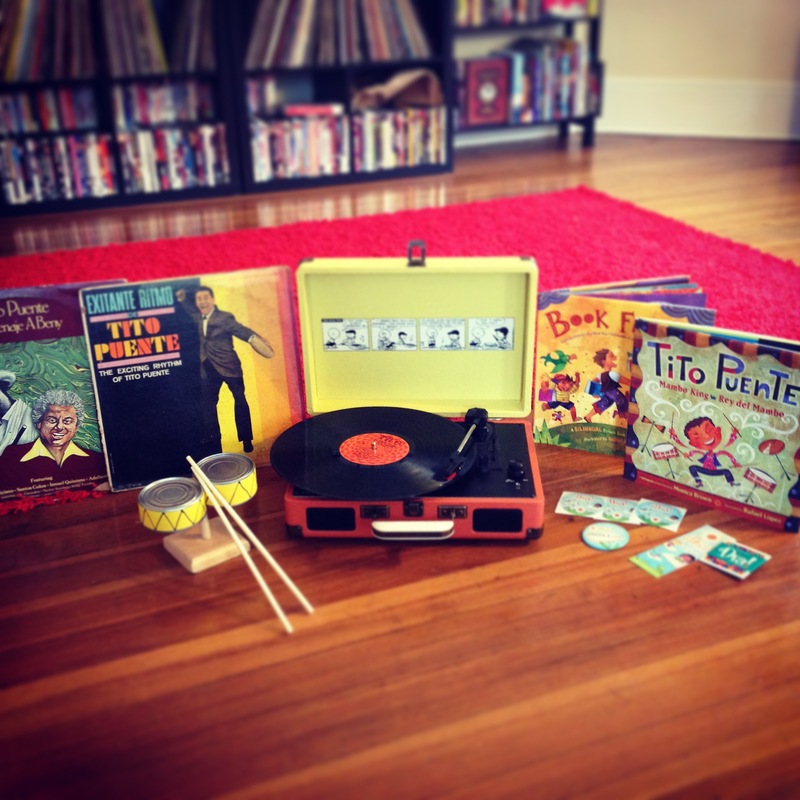 Sujei Lugo at the Boston Public Library will have a Musical Bilingual Story Time (Spanish/English), two art workshop sessions with children’s books illustrator (Caldecott and Pura Belpré winner) David Díaz, and an afternoon of Afro Latin music with a youth percussion group. Impressive for someone who started working there three months ago! The King County Library System celebrates Día throughout its 48 branches with performances and programs, world language story times, and book displays. This year, the celebration culminates in two grand events at local libraries the weekends before and after April 30. “In addition to the musical performances and book giveaways, we’re hoping to connect with community partners to help us celebrate. Yes, this is a library sponsored event, but really, our goal is to build community by connecting children and families through books, stories and our common experiences,” states José Garcia, Library Services Manager who works closely with Jo Anderson-Cavinta, Diversity Services Coordinator. The Boone County Public Library in Northern Kentucky is taking their Día celebration on the road. On Saturday, April 25, the library’s Community Center on Wheels is rolling out their Día on the Lawn Program to Green Lawn Mobile Home Park, which is home to many Hispanic families in Boone County, Kentucky. The Boone County Community Center on Wheels is a custom-built, two-room bus equipped with a classroom to support on-board instruction, computers for access to educational software and the Internet, and resource materials for children and adults. Coloring at a Día program (photo courtesy of the ALSC Office). During the Día on the Lawn Program, participants will be able to check out library books and enjoy a visit from Tales, the BCPL mascot. There will be an emphasis on STEAM activities this year with different stations featuring science and art activities. Face-painting, a piñata, outdoor games, and music will also be available. A free book will be given to each family while supplies last. Whitney Jones, Library Media Specialist at Old Settlers Elementary School in Flower Mound, Texas, is celebrating her first year doing Día; they are “closing the school for the day.” Teachers will oversee every child at 3 stations where the K-5th graders will participate in an obstacle course, bounce in a giant house, and learn to dance the cha-cha. K-1st will have a musical storytime, 2nd-3rd will have a drawing interactive storytime, and 4th-5th will have a Jefferson Knapp author visit. In addition, the 3rd graders have invited their sister school’s 3rd graders to have lunch and share their favorite picture book. The PTA generously donated hardcover blank books so that every student can write their own stories. They can also dress as a favorite book character. The students will also pair up for buddy reading for 30 minutes during the day. Parents have also been invited to lunch and have been invited to dress up in costume, read as mystery readers, and share a dish from their culture which includes Korean, Indian, Middle Eastern, and a small Mexican community. 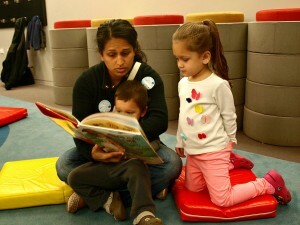 A family reads together at a Día program (photo courtesy of the ALSC Office). Anne Miller from Eugene Public Library and Kristen Curé from Springfield Public Library start planning for Día in October with various community partners for their joint celebration on a Saturday and Sunday for 3 hours. Each celebration attracts 500 people, and Springfield Public Library is a past recipient of the Mora Award for its celebration. This year, they will host author Carmen Bernier-Grand, a local mariachi band, and a local artist, and the children will paint clay pots. Activities tables include face painting, science projects, and crafts. 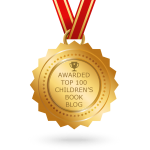 Each child receives a book. This year the organizers will dress up as a book character or person in history, and they expect Chavo and Frida Kahlo to be represented. Each of the cities’ mayors open the event and make a city proclamation. Día de los Niños/Día de los Libros is a state proclamation in Oregon. 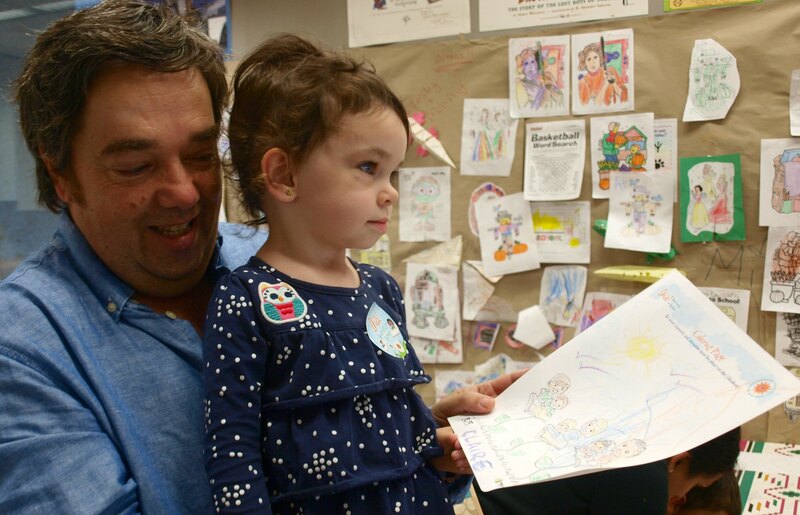 They build up to the day by sending projects to schools and daycares—this year they sent milagros kits—and by infusing different languages and cultures in the April storytimes. As you can see, the ways to celebrate Día are as varied as the communities we serve. Check Pat Mora’s webpage and the official Día page for resources. 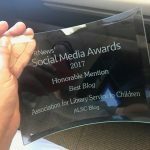 This post was written by the following members of ALSC’s Public Awareness Committee: Debbie Bond, Public Library of Cincinnati and Hamilton County; Robin Howe, King County Library System; and Ana-Elba Pavon, Oakland Public Library.